10 hours of an online elementary Spanish class with Annabelle Williamson. Experience Annabelle Williamson (AKA La Maestra Loca) teaching Spanish to a group of children ages 6-11 at Express Fluency’s summer language intensive and teacher training workshop in August 2017. The video starts from the first moments Annabelle meets the group and covers 4 days of language class (10+ hours of footage). In a short time Annabelle is able to create a vibrant classroom community and engage students in picking up Spanish effortlessly. 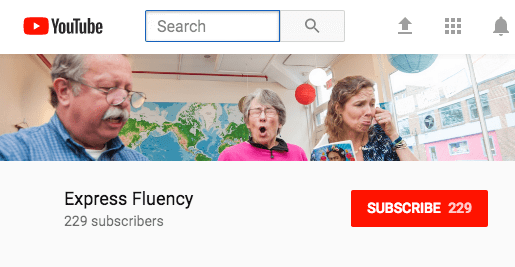 This video is excellent PD for ANY language teacher, but it is invaluable for elementary Spanish teachers in particular. Teachers will experience Annabelle’s approach to classroom management, tons of different brain break activities, how she personalizes the class and gets to know her students, and loads of CI (comprehensible-input) strategies such as storyasking, picturetalk, movietalk, and so much more! After purchasing, you will be directed to log in to your account where you will have access to the video from a membership page for one year from the time of purchase. This course is for individual use only. Please contact us if you are interested in purchasing a multi-user subscription. To get a sense of Annabelle’s dynamic teaching style you can watch a compilation video from our 2017 teacher workshop. Annabelle Williamson, a.k.a. La Maestra Loca, is a passionate elementary and middle school Spanish teacher in New Orleans, Louisiana. She is the 2017 LA Teacher of the Year. Annabelle loves teaching middle school but she has taught students ranging from 2-82 years old. She taught for a year in China in 2014-15 and before that taught for 4 years in public schools in Denver, Colorado, where she learned from a community of brilliant CI (Comprehensible-Input) teachers in the area. Since then she has developed her own unique style, which her students call “loca” or “crazy”. She enjoys helping students of ALL ages acquire the Spanish language. Her goal for her students, children and adults, is communication and joy. In her free time Annabelle enjoys traveling the world and blogging about her travels. She also loves eating! Anything and everything, even duck tongue and sheep brain! Her favorite thing in the world is spending time with her family, and picnicking with her boyfriend Paul and bonus-daughter Isla Rose who just turned three and LOVES all things magical like unicorns, fairies, and mermaids, just like La Maestra Loca.